One of Folly's original cottages, the Love Shack has its original heartpine floors, board and batten walls and furnishings of its era. You can see the ocean from almost every room in the house - or listen to the ocean and feel the breezes on the front screened porch and large deck. There's even a roof top deck over the porch if you want a panoramic view of the island. This rental offers guests a combination of comfort and nostalgia that's getting harder to come by...we have aimed to preserve the same flavor we enjoyed as youngsters coming to the beach, before the era of condos and 'McMansions.' This property has 2 bedrooms and a large living area, both areas equipped with 42' flat screen TVs. Our cottage has approximately 650 square feet. The living area and kitchen are open, divided by a bar/table/counter which is an old hatch door from a WWII Liberty Ship - refinished of course. We welcome children of all ages and dogs. Our property is located on a corner lot. The backyard has a canopy of live oaks and is completely fenced. This home is not nearly as elevated as the newer ones; so there's only 10 steps from the back door to the yard. All these features make pet care and child care a lot easier. DO NOT RENT THIS COTTAGE FROM A CRAIGS LIST ADVERTISEMENT - A NEW GROUP OF SCAMMERS ARE USING THIS AND OTHER VRBO ADVERTISED PROPERTIES TO SCAM TRAVELERS..
After a long career, I chose Charleston as my retirement home. What's so interesting about that is...I traveled several years in search of my perfect spot and ended up only 100 miles from home. Charleston is multi dimensional in what it offers. I enjoy the history, culture, art, music, and academia of downtown, but cherish most the beach, boating, and bohemian attitude of our barrier islands (Folly). So, for now, I lawyer a little with my downtown firm, and spend most of my time on the beach, water, or traveling. I now have two baby grandchildren in the area...so my traveling is taking a second seat. I chose Folly Beach for its relaxed atmosphere and convenience to downtown Charleston. I'm able to enjoy the beach just as I did as a teen at Folly because it has retained its identity. There is one bath on the main living floor. We do have another bath in the basement....but it is not heated or cooled. Central heating and air - and two additional window units in the living area and master bedroom for those especially hot summer days! Linens are provided for your stay, and beds will be made when you arrive. Washer & dryer located in separate downstairs basement. This single family home in not duplexed. It's all yours. No other units on property. In addition to internet, we also have a "smart TV" for those of you who like to use other sources. However, our XFINITY is loaded with entertainment possibilities. See WiFi below for password. Towels are provided - but please bring your own beach towels! They say our kitchen is well equipped with what you need to cook and serve. Our inside dining area/bar will seat 5 persons; but there's also 2 outside tables on the front deck which will seat 5-6 more. XFININTY on "smart TV" in the living area - with HBO, etc. Large ping pong table in the basement. A few beach toys - buckets, shovels, boards, etc are in the basement. Boogie boards...floats. Beach chairs, etc. Large deck on front of home with ocean view; small viewing deck on roof top of home. Across the street from the beach with wide accessible ocean access. Our cottage is located on a corner lot, so you can walk right across the street to the ocean. 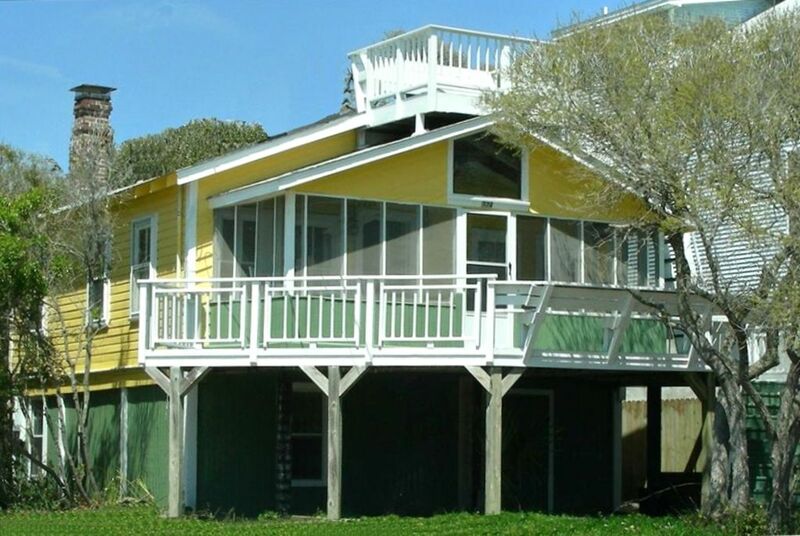 Wonderful rental at Folly Beach! My husband and I were able to go to the Love Shack with our two dogs and had a blast! We got to meet GG when we first arrived as she was finishing cleaning. She was so friendly and helpful. She was nearby for any questions or issues that we may have had (though we didn’t have any.) The Love Shack is decorated beautifully and makes you feel right at home. Our dogs loved the fenced in yard and screened porch. The extra air conditioning window units certainly helped to keep the house cool and comfortable in the SC heat. We have no complaints and will definitely return to the Love Shack in the future! Relaxing stay that’s close to the beach. This is a cozy cottage that is perfectly situated walking distance from the beach and restaurants. The owner and caretaker thought of everything, including cookware so we could eat at home when we were happy-tired from the beach. The ping pong table, vintage LIFE game and puzzles were perfect for nesting. Truly a home away from home! This ‘bungalow' is cozy and charming and has everything you need for a wonderful visit to Folly with your pet. Location is great and owner is super responsive! We had a great long weekend staying at the Love Shack recently. It was cozy and clean. An easy walk to the center of town. The view and beach access were perfect. During our stay I had a few questions about the area. Gigi was always ready with an answer for me. I would stay here again! This was our third visit to laid-back Folly Beach, our longest (3 weeks) and our best by far! Being a short block from Folly's awesome beach and seeing/hearing the Atlantic from the porch/deck made all the difference. Having a fenced yard for our pup was useful, and the caretaker Gigi could not have been more accommodating. You can trust every word of the owner's Homeaway listing description, though "Charming Pet Friendly Oceanview Bungalow - Prime Location - Steps to beach" says it all! Love Shack is directly across the street from the beach. Located on a corner lot on second row, your ocean views are unobstructed and your beach path a direct shot through the widest beach access at Folly. We are 3 blocks from downtown (Center Street) and 3 1/2 blocks from the pier. Most guests just park their car for the week....and walk or bike everywhere. And, this is a good thing - as parking is at a premium downtown during Spring, Summer, and Fall. Love Shack's view and location are perfect. This location is ideal for young families and folks who like to walk back and forth from the beach during the day. And, for dog lovers who like to check on their pets many times each day while on the beach. Guests also enjoy watching their friends and children in the ocean from Love Shack's large front deck. Can cancel within 60 days of reservation and get refund.